Almost everyone who buys on eBay wants to bid and win an item, and then when it gets to their home, they want to be able to use it right away. Of course, there is nothing wrong with that way of thinking, but if you want to win items at a lower price, consider those items that need basic repairs. When bidding on appliances, for example, if a few knobs are missing, it's not a big deal. Sure, it looks bad on the pictures, and that's why you'll win it with a smaller bid. Appliance knobs can be found almost everywhere: from searching on the Internet, going to your local appliance dealer and even going to hardware stores. They are inexpensive too, and well worth your while to win an auction for a far lesser price, and then purchase a knob for less than a dollar. All knobs can be replaced, and if you are willing to search out a knob for your appliance, you'll win it for far less when the auction ends. Don't let broken plastic pieces stop you from bidding either. As long as the pieces are there, you will be able to find a plastic glue or cement that will literally, weld the piece back into place. Now, we aren't talking about Elmers glue here, we are talking modern made epoxies and polyurethane adhesives. These can be found at hardware stores everywhere, and they will attach any piece of plastic back together that will last a lifetime. You can do much the same with wood and ceramics. 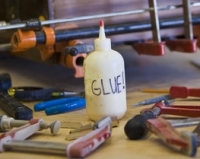 These items can easily be glued back together with modern wood and/or ceramic adhesives. Even veneer that is peeling off that gorgeous piece of antique furniture can be reattached permanently, and no one will ever know. Yet during the auction, many people will balk at putting in a bid, because they either want the piece to be complete or they don't want to take the time to make an easy repair. So next time you are looking for an item, don't look past the ones that are not complete or all in one piece. The chances are that they are easily repairable, even if you have to locate a part or two. And by just doing that, you'll be bidding and winning for far less money every time. And remember, no matter what you bid on at eBay, BAM's got your back! One of the secrets to selling an item on eBay, and making the most profit, is to have the auction item end during prime-time, between 7 pm and 10 pm. That way, the most people possible will be viewing and bidding on the auction before it ends. Because of that fact, the most diverse array of items will be found to bid on that end during that time frame. You will automatically be bidding against the highest amount of people that are interested in that item because it ends during the time when nearly everyone is around. Consider this. 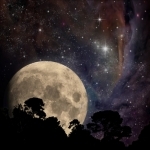 If you can find the same or similar item listed that ends long after prime time, particularly in the middle of the night, you stand a far better chance to getting a really good deal. You see, just because the auction concludes so late, many people would rather sleep then wait for the auction to end. Let's face it, people have to work the next morning, go to college, get their kids off to school etc. etc. etc. Viewed that way, in most cases sleeping seems like a far better idea than bidding on an auction. This behavior opens up a window of opportunity to those that can stay awake. Because most of the bidders will be sleeping, those hardy souls who stand-to at their computers have the golden opportunity to be one of the few bidders left. And generally, the fewer the bidders, the less the item will eventually sell for. In reality, all you are doing is playing the percentages. The higher the percentage of people that are available to bid, the more bids there are likely to be, the higher the bids have the potential to go. Conversely, the lower percentage of people that are available means less bidding and a lower price when the auction ends. For those of you with sniping programs, this task is even easier. Do your research, find the item, and set the sniping parameters to bid on the item, as close as you dare, to the auctions end. But remember, a power outage, a funky computer blip or even if someone inadvertently turns off your computer, any of these conditions will negatively affect your sniping results. Although this strategy may not be right for everyone, just knowing it means you can buck the odds. If there is something you really and truly want, it may be worth your while to stay up late, have a few more cups of coffee, and win an item on a low bid because you waited until after prime-time! That feeling of instant gratification of getting a really good deal, will be worth any of the sleep that you lost. eBay offers a means by which people from across the globe can connect and conduct business. The opportunities to buy and sell on eBay has allowed for a world in which you are no longer limited in what you can purchase based on your location. In order to maintain as a source of honest and accountable commerce, there are certain mechanisms that are in place to foster confidence among buyers and sellers alike. 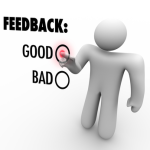 One important and highly effective mechanism is the feedback feature. Customers looking to buy an item or service should filter their options using several factors. Cost, shipping, and the availability of receiving exactly what you are seeking are the keys to choosing among eBay sellers. Once you have narrowed your choice to those listings that meet your standards closest, dig even deeper to choose the vendor to receive your business. The feedback section can prove to be an invaluable tool in choosing a reputable seller. Look for feedback that matches the type of product of service you are seeking from the seller. If you are buying a service, consider the feedback related to services over those related to items that the seller may have previously sold. A seller could have a stellar record of delivering services in a timely and professional manner while struggling to deliver items as well. That distinction will allow you to differentiate between sellers of similar feedback rating. The information listed in the seller’s feedback will alert you if the vendor has had previous complaints about the timeliness and quality of their delivery. You can use the seller’s reputation when deciding what to offer for an item or service. A seller with a sub-par feedback rating may not attract the same amount as a vendor with an impeccable rating. There are no strict rules as to how you should use the information you glean from feedback but as much information you can gather and consider as possible can make the difference between a smooth and satisfying transaction and a transaction that is rife with snafus and delays that would be easily predicted by the tenor of the seller’s feedback. After you have weighed all of the information at your disposal and have chosen a seller from whom to purchase, provide your own feedback once the transaction is completed. By adding feedback you will contribute to the eBay community and assist future buyers in choosing the vendor they will trust with their business. The community works best for everyone when as many people as possible contribute to all of the tools at their disposal. Before you bid on eBay you should know the total cost of the item you're interested in. Bid price or Buy It Now price is only part of that cost. There is also shipping cost and sometimes tax. Whenever I purchase anything over the internet using eBay or another website, I always add shipping cost and tax when calculating my cost of an item. When shopping on eBay, sometimes you'll see low bid price but high shipping cost. In some circumstances high shipping fee is justified for large or heavy items that cost a lot to ship, for expensive items that need to be insured or when shipping internationally. There are some sellers who intentionally set shipping and handling fee high as a strategy to get you to buy an item. If you think you found a good deal and purchase an item without looking for shipping cost, you might learn that it wasn't such a good deal after all because you have to pay outrageous shipping fee. This practice was more common in the past where sellers used it as a way to avoid paying eBay final value fees. Seller would charge low price for an item and high price for shipping and handling. For example seller would list their item for $0.99 and charge $14.99 shipping and handling fee even though it would cost them a few dollars to ship the item. This way they would get almost $16 for an item but pay eBay fee on $1. Although eBay now charges final value fee on entire amount (including shipping fee) so it makes no sense to jack up shipping cost, there are sellers who do this so their price looks lower than competition. As far as I'm concerned it's a bad practice because it can easily alienate your customers and I usually do not buy from sellers who do this. 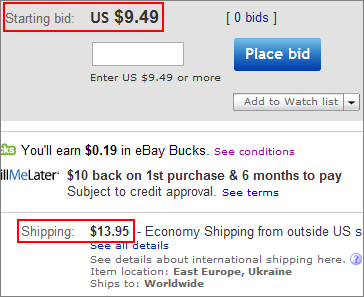 Remember to always know the total price of the item you're considering to purchase on eBay. This includes auction price or Buy It Now price, shipping and handling fee and tax if applicable. Looking only on the price of an item can sometimes be misleading. To get more eBay buying tips, see my other blog posts. Also, check out my eBay buyer software. Whenever I want to purchase something through eBay, I first run through steps in my head to try to identify red flags. 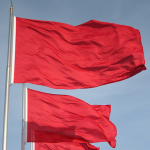 If I see too many red flags or sometimes even one, I will not hesitate to move on to the next seller. I don't know who originally said it but I found it to be true more than once: if something seems too good to be true, it probably is. First thing I always check is seller feedback. If I don't see 100% positive feedback, I'll look at negative comments to see what unhappy buyers have to say. Sometimes seller responds to negative comments and I'll be able to get a feel of the type of person this seller is. For instance, if I see seller calling buyers names I might move on to the next seller. On the other hand, even if I see lower feedback score but I see that seller explains negative comments and those answers make sense, I might still consider this seller. I also like to see what other items the seller is currently selling and also what they sold in the past. This can give me clues if the seller is legit. For example, if I see that seller was selling some kind of cheap items in the past and suddenly started selling some expensive items that would raise a red flag for me. On the other hand if the seller lists similar items as in the past and received positive feedback for those items, I'm probably not going to get scammed. See my Research eBay Seller blog post for more in depth explanation on how to check feedback and research seller. While looking at seller's other items for sale, I also like to look at pictures to make sure all of them look similar especially if the item I'm considering is expensive. If I see totally different pictures from one listing to the next (with different setup, background) that could be an indication that the seller stole the pictures and actually does not have those items. Be very careful if you get contacted by a seller asking you to complete the transaction outside of eBay. I learned this one the hard way in 2003 when I was scammed on eBay in exactly this way. Although I think now it's a lot harder for seller to contact you, keep this in mind. To avoid being scammed on eBay, make sure you do some research before you purchase. Use common sense and remember that if something seems too good to be true, it probably is! Check out my other blog posts for more eBay buying tips. If you're looking for good deals, try my eBay software for buyers called Buyer Auction Manager. It will help you save money and find bargains.